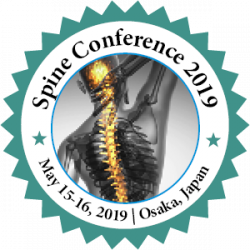 Conference series is proud to announce the “5th Global Congress on Spine and Spinal Disorders”, which is to be held during May 15-16, 2019 at Osaka, Japan. On this great gathering, Organizing Committee invites participants from all over the globe to take part in this annual conference with the theme “New Advancements, Principles and Treatments in Spine and Spinal Disorders”. Spine Conference 2019 aims at sharing new ideas and new technologies among the Spine surgery professionals, Physicians, scientists, doctors, University professors, researchers and students from areas of Spine and Spinal Disorders to share their recent innovations and applications and indulge in interactive discussions and technical sessions at the event. The Conference will also have a space for companies and/or institutions to present their services, products, innovations and research results.